Toluna App Review: Is This App Worth It? Last updated on February 20, 2019 By Nat Leave a Comment This post may contain affiliate links. We appreciate you supporting Rags To Niches! Full disclosure here. I’ve noticed something recently, while reviewing various apps which claim to help you make or save money online. That is, that I’ve found many of the survey apps so far, much more enjoyable than the actual website version. This has also been the case with Toluna – as I did a Toluna Review ages ago and I didn’t rate it very highly. Is it worth your time though? Or are there better alternatives? Let’s find out! Download Available: IOS and Google Play. Money Making Opportunity: Do you enjoy peanuts? Overall Verdict: This is a legit app, which I would recommend you do more for enjoyment than any financial gains. I far prefer this App to the website version! Stick with me until the end of this post, for other ways you could make more in the long run. What Is Toluna App About? The Toluna App is an extension of the main website Toluna and makes it easier to complete paid surveys on-the-go. This company gives regular people the chance to earn a small amount of cash, by doing online surveys and polls. You actually earn points for completing these surveys and these points can be exchanged later on, for rewards. Toluna offer a wide variety of rewards, including many different gift cards options with popular retailers. An interesting thing I’ve found with survey Apps, is they also tend to have much better feedback in general than their website counterpart. (So, it’s not just me that seems to find them preferable!). On Trustpilot, Toluna only has one lonely star! Survey police… it has one and a half stars. 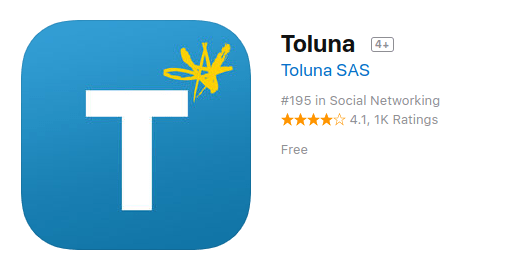 By contrast, Toluna App has 3.5 stars on Google play and over 18 THOUSAND ratings. OK so, it may only be 3.5 rating .. it’s not THAT amazing I know. But with over 18,000 ratings overall?! It’s really not all that bad. It also has over four stars on the App store, with over 1000 ratings at the time of writing this post. After I downloaded the App and opened it up, my first thoughts were… That it looked pretty good! I was expecting a clunky, dated sort of App. But this was modern and slick, it wasn’t buggy and was smooth to use, (at least at first!). The quickest way you sign up is via Facebook, but you could also sign up with your email address. That takes a matter of seconds and you’re taken into the main App, which gives you a walk-through of what you can expect of the App and how you make money and interact with the App. While there are the usual paid surveys, there are also some things that are just for fun. 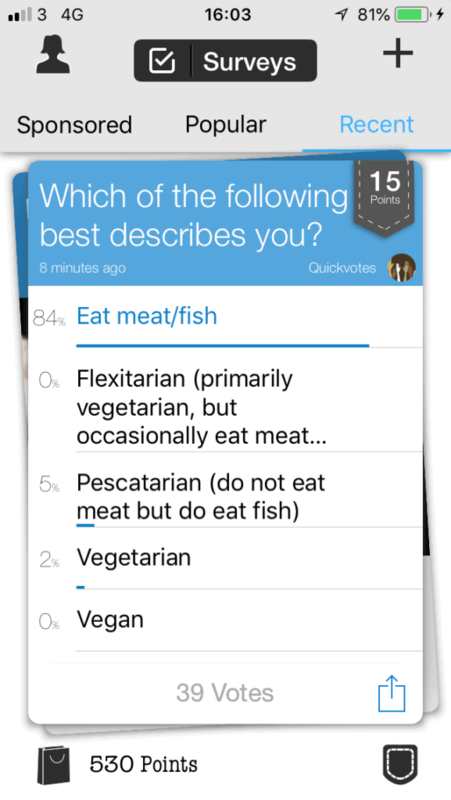 For example; you can ask your own questions to the Toluna community and create polls. You can also answer other peoples questions/polls. You interact with the App via sliding cards, which you swipe out of the way, (an interesting design that was quite fun to use!). Some of the slides would contain simple questions – and some of these questions award you with points, (I only saw 15 points for these). Others would not offer any points and seemed to be, just for fun. For example; I was asked a question below regarding my eating habits…. But other questions that popped up, did not give you any points…. The answer purely seemed to be voluntary info. While I didn’t really see the point of volunteering some of this info for nothing, I could see that some of it could be interesting. When you vote on an answer, you get to see what other people have answered as well. Anyway, all of this would be OK, if the points you made for some of the questions were actually worthwhile. But that’s where the problem was, the amount of points you actually need to make to exchange for rewards… is pretty huge, (I will explain exactly how much in a moment). I was pretty quickly offered a couple of full-length surveys. These were both worth 2000 points, but would each take 25 minutes… Approximately. It’s the approximate aspect that concerned me, as so often these things take longer. But anyway, I decided to go for it. Unfortunately, when I was right near the end – I made the mistake of clicking out of the App and lost the entire thing. I thought maybe I could go back and pick up where I left off… But nope, the survey was gone :(. 20+ minutes wasted unfortunately. However, when I returned later, there were a bunch more surveys available. Most of those were for 1600 points… However, the first two I tried, I didn’t qualify for, (this didn’t surprise me and is common). Useful post: The survey site that won’t chuck you off! I started another relating to food, which was promising – but I had to put m phone down to answer the door …. and I was locked out of the survey… AGAIN! Worse still though, when I returned, I had trouble logging in. I pressed “sign up,” by accident, (meaning to press “login,”) but it wouldn’t let me go back to the login page…. I was just stuck on the sign up page and no way of getting out of it. I was totally stuck at this point… I went back later and it was still on the sign up page. I figured the only thing to do would be to delete the whole App and reinstall it. That worked… But wasn’t ideal obviously! Will I Ever Complete A Survey? When I reinstalled the App, there were suddenly a lot of surveys…. not just regular ones, but loads of the mini 15 point polls. I did a whole bunch of 15 point polls and then tried to do some bigger surveys. One was offering up to 480 points and was about food – I managed to get through it, but only got 240 points, (see below). Unsure why it’s not a specific amount, but I was pleased to get that much – as it only took me a few minutes. But How Many Points Do You Need To Cash Out? It’s all very well doing all these surveys and polls for points, but how many do you actually need to get a gift card?? How many points you need, is going to depend on your location – so, this isn’t going to be the same exclusively across the board. You will be able to find out exactly what your points mean, when you download the App. In my case, I’m in the UK and you can see a small selection of the gift cards below. The above image is only a small selection of the vouchers available. Obviously, if you’re in the US or anyone else – the points will be a bit different. For example; I believe a $10 gift card is around 30,000 points. 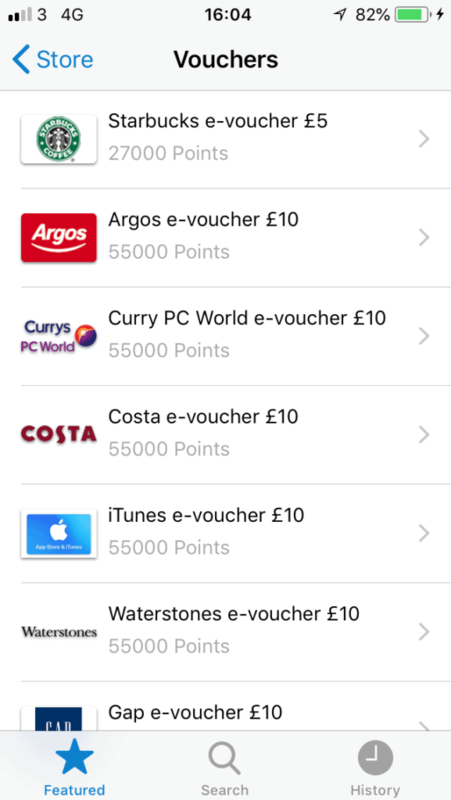 In any case, if I wanted a £5 Starbucks voucher, I’d need 27,000 points. I currently had 1325 and I’d need over 20 times that for the Starbucks voucher…. Let’s just say that I decided to do a 2000 point survey every day for 25 minutes…. Then it would take nearly two weeks of doing that every single day, to make a £5 Starbucks voucher. Obviously, if you’re just doing this for fun and you enjoy it, then the money is just a mini bonus. But if you’re doing it because you’re trying to actually make extra money, then clearly this isn’t a very good way of doing it. One Good Thing? There Seem Plenty Of Surveys! One of the biggest issues I’ve found with these type of sites, is that there just aren’t enough surveys available for it to be worth it. Take a recent App I reviewed, Citizenme…. There were barely any surveys available to me. In fact, I had to wait well over a week to be offered a survey with Citizenme and it was only for 20p!!!! (I haven’t had another since!). Whereas, every time I now go on Toluna, there are extra surveys available to me. There are constantly more of the mini ones, (for 15 points) and several of the bigger surveys, offering between 1600-2000 points. Also, while I did get screened out of many surveys, it seemed to be less than I have with many sites I’ve tried. Points for answering simple questions. You need a lot of points to be able to cash out. Can have the odd glitch. If you exit the survey App by mistake mid-survey, you cannot get back to it. Is The Toluna App Worth It? It really depends. I really think you need to enjoy using the App and completing the surveys for it to be worthwhile. Reward wise, you just have to spend too much time on the App to generate rewards. 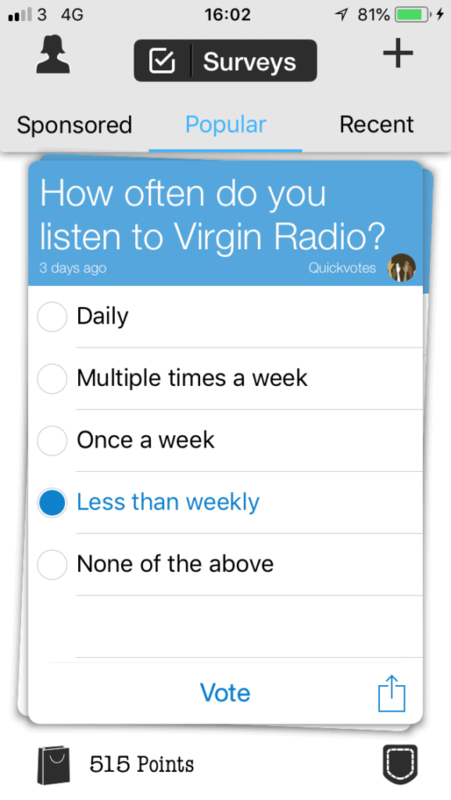 On the other hand, I’ve seen far worse survey Apps! So, if you’re looking for something to pass the time while you have nothing else to do, then you may want to check this one out. I was pleasantly surprised by this App, as I hadn’t previously rated Toluna very highly, (with their website version). The good thing is, it’s free to download so, you won’t lose anything by trying it, (apart from your time). Are You Trying To Make More? If you’re looking to make more like a part-time, (or even full time) income… Then definitely survey panels are not the way to go. There are so many ways you can make extra money online, but the real opportunities will always involve work and effort. However, it’s so much more worth your time to actually learn skills that will bring you in a better income over time. Check out these 40+ ways to make money online for ideas. Alternatively, I recommend you try the free training here. * Hands down, it’s what has helped me the most. I hope you found my Toluna App review helpful! If you have any questions, let me know in the comments!